J. Kumar Chaurasia, Afroz, N. , Maheshwari, V. , and Naim, M. , “Sclerosing stromal tumor of the ovary presenting as precocious puberty: Unusual presentation of the rare neoplasm”, International Journal of Medicine and Public Health, vol. 4, no. 3, pp. 307-309, 2014. P. Kumar Rai, Jindal, P. Kumar, Rai, P. , Rai, P. Kumar, and Rai, S. Nat, “Screening of chronic kidney disease (CKD) in general population on world kidney day on three consecutive years: A single day data”, International Journal of Medicine and Public Health, vol. 4, no. 2, pp. 167-170, 2014. R. Kumar, Gupta, S. , Jindal, A. , Kakkar, S. , and Kaur, A. , “Screening of -thalassemia trait and other hemoglobinopathies among blood donors in Punjab”, International Journal of Medicine and Public Health, vol. 5, no. 1, pp. 106-109, 2015. S. M. K and Rajendran, A. , “Scrub Typhus in Adults – A Case Series from a Tertiary Care Hospital”, International Journal of Medicine and Public Health, vol. 1, no. 2, pp. 34-46, 2011. Y. Keche, Yegnanarayan, R. , Bhoyar, S. , Agrawal, R. , Chavan, R. , and Mahendrakar, P. , “Self medication pattern in rural areas in Pune, India”, International Journal of Medicine and Public Health, vol. 2, no. 4, pp. 7-11, 2012. M. Divya, Bharatesh, S. , Vasudeva, G. , and Varalakshmi, C. , “Self-Medication Among Adults in Urban Udupi Taluk, Southern India”, International Journal of Medicine and Public Health, vol. 6, no. 3, pp. 126-129, 2016. C. Bale, Kakrani, A. L. , Dabadghao, V. S. , and Sharma, Z. D. , “Sequential organ failure assessment score as prognostic marker in critically ill patients in a tertiary care intensive care unit”, International Journal of Medicine and Public Health, vol. 3, no. 3, pp. 155-158, 2013. T. Jayakrishnan, Murkoth, A. , George, B. , Rao, B. , and Vidya, K. , “Sero Prevalence of Rubella Immunity in Pregnant Women in Kerala, India”, International Journal of Medicine and Public Health, vol. 6, no. 4, pp. 189-192, 2016. A. B. Karad and Khade, S. L. , “Seroepidemiological study of herpes simplex virus type 2 infection in HIV positive patients, Delhi, India, 2007”, International Journal of Medicine and Public Health, vol. 3, no. 3, pp. 168-172, 2013. L. Adhikari, Pradhan, A. , and Khatri, D. , “Seroprevalence of Hepatitis B, Hepatitis C, and human immunodeficiency virus and their risk factors in adolescents in East Sikkim, a Himalayan state of India”, International Journal of Medicine and Public Health, vol. 6, no. 3, pp. 144-147, 2016. S. Saha and Rathod, H. , “Shortage of doctors in rural health centers: Empirical evidence from Gujarat”, International Journal of Medicine and Public Health, vol. 2, no. 3, pp. 53-60, 2012. D. M. Mhaskar, Mahajan, S. K. , and Pawar, K. C. , “Significance of serum magnesium levels in reference to acute myocardial infarction and role of intravenous magnesium therapy in prevention of cardiac arrhythmias following myocardial infarction”, International Journal of Medicine and Public Health, vol. 3, no. 3, pp. 187-191, 2013. S. Mohd Razi, Manish, G. , Keshav, G. Kumar, Sukriti, K. , and Gupta, A. , “Site or Size of Waist Circumference, Which one is More important in Metabolic Syndrome?”, International Journal of Medicine and Public Health, vol. 6, no. 2, pp. 69-72, 2016. D. Harshe, Karia, S. , Rajani, S. , Bharati, A. , De Sousa, A. , Shah, N. , and Mishra, P. , “Smartphone Usage Practices, Preferences and its Perceived Effects in Medical Students at a Tertiary Care Medical College”, International Journal of Medicine and Public Health, vol. 7, no. 1, pp. 51-55, 2017. V. Bajpai, Saraya, A. , and Bhasker, S. , “Social Meaning and the Possible Societal Responses to the Public Health Problem of Tuberculosis – Part 2”, International Journal of Medicine and Public Health, vol. 1, no. 3, pp. 39-47, 2011. 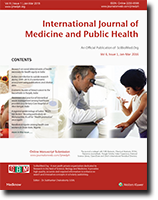 V. Bajpai, Saraya, A. , and Bhasker, S. , “Social Meaning and the Possible Societal Responses to the Public Health Problem of Tuberculosis – Part 1”, International Journal of Medicine and Public Health, vol. 1, no. 3, pp. 27-38, 2011. V. Bhaskar Srirangam, Kumar, M. Kiran, Mukerji, S. , and Gupta, R. , “Socio Economic Factors Effecting Immunisation Coverage: Focus Areas.”, International Journal of Medicine and Public Health, vol. 7, no. 3, pp. 147-151, 2017. O. T. Ayoade, Blavo, F. J. , Farotimi, A. A. , and Nwozichi, C. U. , “Sociodemographic factors as predictors of sexual behavior of secondary school students in Lagos State, Nigeria”, International Journal of Medicine and Public Health, vol. 5, no. 2, pp. 152-156, 2015. N. Nagappan and John, J. , “Sociodemographic profile of orofacial cleft patients in India: A hospital-based study”, International Journal of Medicine and Public Health, vol. 5, no. 1, pp. 35-39, 2015. S. Esam Mahmood, Bhardwaj, P. , Srivastava, J. Prakash, Mathur, K. Prasad, Zaidi, Z. Haider, and Shaifali, I. , “Sociodemographic risk factors of cardiovascular disease in rural Lucknow”, International Journal of Medicine and Public Health, vol. 2, no. 1, pp. 56-61, 2012. N. Pai Kotebagilu, Shivanna, L. Mysuru, Urooj, A. , Thomas, A. , Shanthilal, M. , and Maruthavanan, S. , “Socio-Demographic, Somatic and Disease Profile of Cancer Patients in Tertiary Care Centres of a City in Karnataka, India”, International Journal of Medicine and Public Health, vol. 8, no. 2, pp. 82-88, 2018. A. Singh and Dixit, S. , “Socioeconomic Patterning of Cardiovascular Disease and its Risk Factors among Indians: A Systematic Review of Literature”, International Journal of Medicine and Public Health, vol. 7, no. 1, pp. 01-17, 2017. G. Ku. Padhy, Pani, M. Ranjan, and Mishra, R. N. , “Some operational issues of Mass Drug Administration in urban areas: need to develop urban specific strategy”, International Journal of Medicine and Public Health, vol. 1, no. 1, pp. 17-19, 2011. S. Cinaroglu and Baser, O. , “Spatial Distribution of Total Number of Medical Devices in Turkey: A Classification Analysis”, International Journal of Medicine and Public Health, vol. 7, no. 2, pp. 102-106, 2017. S. Adinarayanan, “Specialty training in Palliative Medicine – Need of the hour”, International Journal of Medicine and Public Health, vol. 6, no. 3, pp. 109-110, 2016.